Do you ever sit down to have your daily quiet time and not sure what to do? Does finding stillness seem like a luxury and not something you can fit into your day? It's a common issue. We finally decide to make time in our daily schedule for daily devotions only to discover we are not sure what to do or realize that what we are doing isn't working. Over the years I've struggled with finding a daily devotions habit that works for me. I've tried all sorts of devotionals, reading plans, prayer patterns, journaling, books, and more but there wasn't anything that I would stick with for long. Through trying all of these different methods, I've been able to create a journaling and prayer practice that works for me, and more importantly, something I have stayed for a long time. It has made such a difference in reducing stress, anxiety, and has helped me connect better with what I'm reading in my Bible each day. I'm inviting you to join me for the 7-day Be Still Project. 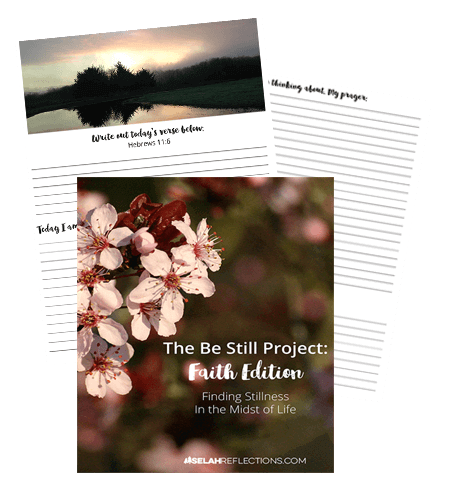 A daily devotional journaling project to help you establish a practice of finding stillness in the midst of your life. Each day includes a beautiful image of God's amazing creation, a verse to write out, space to express gratitude, a place to write out what is on your heart and mind. You will also receive a short daily email with a quote and thought about the importance of finding stillness in your day. To join me on this journey, enter your name, and email address below and the 20-page journal will be available for download right away.